College Football Playoff Update: Does Ohio State Have A Shot? Devin Smith of the Ohio State Buckeyes celebrates scoring a touchdown on a 44 yard pass in the second quarter against the Wisconsin Badgers in the Big Ten Championship at Lucas Oil Stadium on Saturday in Indianapolis, Indiana. As of early Saturday evening, the college football playoff picture seemed reasonably straightforward. Alabama and Oregon won their conference championships easily. And TCU’s dominant win over Iowa State would seemingly make it hard for the committee to drop a team they’d ranked No. 3 previously out of the four-team playoff entirely. But the Ohio State Buckeyes have made the committee’s job tricky. Their 59-0 win over No. 13 Wisconsin in the Big Ten Championship game — a dominant performance against a good opponent — just might be enough to compel the committee to reconsider. Alabama and Oregon will earn two of the four playoff positions. They’ll very probably be ranked in that order (Alabama at No. 1 and Oregon at No. 2). Baylor probably won’t make it. The Bears had a nice win of their own on Saturday, defeating No. 9 Kansas State 38-27 at home in Waco, Texas. But Baylor was ranked No. 6 heading into the weekend and the team ranked just ahead of them, Ohio State, couldn’t have been any more impressive. Excluding Baylor will cause some controversy since they beat TCU earlier in the year, but it’s the Buckeyes that will put more pressure on the committee. The model has TCU with a 91 percent chance of making the playoff, Florida State with a 68 percent chance, and Ohio State with a 40 percent chance. 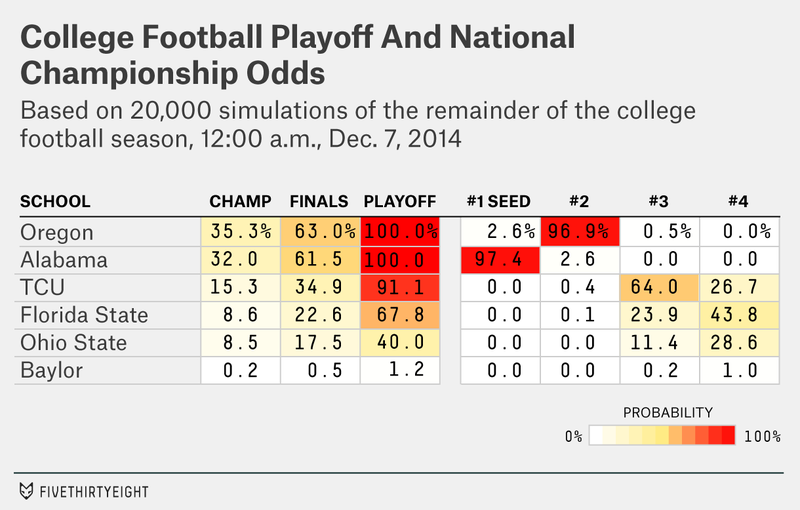 It gives Baylor just a 1 percent shot. TCU’s position would seem to be the safest of the three, but it’s less safe than it appeared earlier on Saturday, when the Horned Frogs’ chances were as high as 98 percent. Although TCU dominated Iowa State, the Cyclones were by far the weakest opponent that anyone in the top six faced. The committee could also sidestep the whole TCU-vs.-Baylor debate entirely by excluding both Big 12 teams from the playoff. Florida State’s narrow win was characteristic of its entire season. Computer rankings don’t like the Seminoles that much because they’ve won by middling margins against mediocre opponents. Georgia Tech was a good opponent, but this win was also narrow. Still, concerns about schedule and “game control” aside, would the committee really deny a 13-0 Florida State team a slot in the playoff entirely? Especially given that they’re the defending national champions and were also undefeated last year? Florida State, in fact, has not lost a football game in more than two years — they have a 29-game winning streak. The model says it’s possible — after all, the committee has twice had other teams leapfrog Florida State even after it won. But the model isn’t considering the political implications of leaving a team with a 29-team winning streak out of the playoff. Personally, I think the Seminoles are slightly safer than the model implies, while TCU is slightly less safe. But Ohio State has at least given the committee something to think about. They and Baylor will ensure the calls to expand the playoff to six or eight teams will come soon, and forcefully.